A series of earthquakes and aftershocks hit Myanmar on Saturday and Sunday with their vibrations being felt by people in several districts of Chiang Rai. The Thai Meteorological Department’s Seismological Bureau reported that at 4.23 pm on Saturday (Feb 3), an earthquake measured at 2.1 on the Richter scale struck at the depth of one kilometer in Wiang Chai district followed by an aftershock which was felt in Wiang Chai, Muang, Mae Lao, Mae Chan, Mae Sai, Wiang Chiang Rung, Phan and Chiang Saen districts. Several resident said they felt dizziness, saw tables shaking and glass windows vibrating. There were no reports of damage. 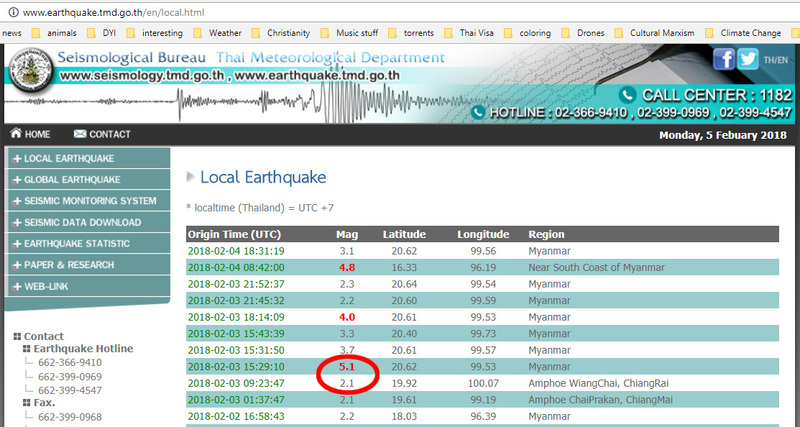 That is very strange, we didn't feel the 2.1 at 4:23 PM, but we did feel the 5.1 in Myanmar at 10:29 PM same day. maybe people are confusing the two? Hopefully they were "Good vibrations". Yes at 10.29 PM it felt as if someone had pushed the back of my computer chair , nothing more since. It had no effect on my 2 cats but it takes a lot to shift them.